If you are planning to enjoy a day in the United States, San Francisco is the perfect place as it boasts lots of places that can grab your attention. San Francisco is one of the most beautiful cities in the United States! Its scenic beauty perfectly describes what the city is all about. To make the most of your stay in San Francisco, you need to know about some of the places and prominent spots first, so you can save a lot of your time and enjoy several things within a day. Use subways to get around all San Francisco within a day. This is the fastest way to see the entire city in a few hours. To save a few dollars, you can hire a cab for the whole day. Some cab companies offer a subscription that allows you to travel at a fixed price throughout the day. If, however, you have limited time available, discover the monuments of San Francisco on foot, exploring the city life and stopping by interesting spots such as parks and museums. Stow Lake is one of the best places in San Francisco and you probably spend the entire day enjoying the scenic beauty. You can enjoy lots of stuff at Stow Lake such as paddle boats rowboats. If you are not on a tight budget, you can even rent a boat and explore the entire lake all by yourself. There is Golden Gate Park where you can do some cycling and hiking. Visit San Francisco without visiting art galleries and museums? Nearly Impossible! You only have to choose from a long list of worth seeing art galleries and there is definitely something for you. There are several good galleries in the city. 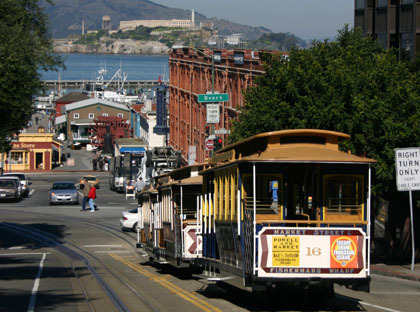 If you are in the Bay Area in the city, you can see museums like California Historical Society, Cable Car Museum, Beat Museum and Asian Art Museum of San Francisco. If you want to gain some insight into old San Francisco, Haight Ashbury is the perfect place and is ready to make your day interesting. You can see lots of stuff in the area as there are lines of stores selling clothes, toys and stuff related to hippies culture. This place should be on your list of preferred places. The entire is packed with shops and food chains.